Competency-based education (CBE) grew out of educational experiments in mastery learning, learning from apprenticeship and competency-based training models developed within industry and the trades. Early experiments grew out of schools like Western Governors University and were encouraged by early adopting states like New Hampshire and Ohio. Competency-based theological education (CBTE) grew out of a need to re-think pastoral training. Pastors were being prepared for vocational ministry in a primarily academic setting, and upon graduation, students were proficient at writing papers and exams, but not always ready or equipped for success in the field. Northwest Baptist Seminary began looking to other vocational training models for inspiration, and found it in the “reverse-engineered” approach of the CBE movement. In 2010, they started with the end goal–identifying competencies common to the most successful pastors–and worked backwards to the design the program content and educational approach. Since 2010, the CBTE movement has gained momentum. 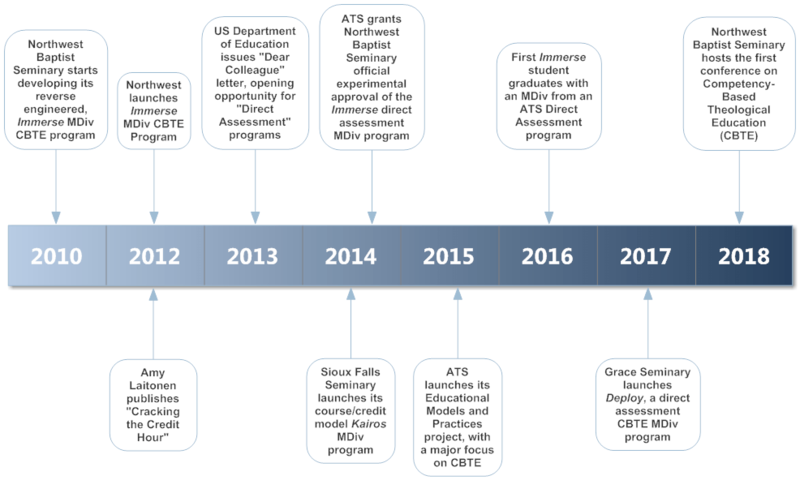 Three schools are currently offering ATS-accredited CBTE programs, with dozens more actively exploring how to integrate CBTE into their own suite of programs. Northwest Baptist Seminary has provided consulting services to many ATS schools interested in CBTE in the past 2-3 years, and currently hosts many CBTE programs for various networks on its technology platform.